Associate Professor, Department of Health, Human Performance and Sports Management, University of Arkansas at Little Rock, USA. Visiting Assistant Professor, Health & Human Performance, Berea College, USA. The concept of perfection quotient (PQ) that imbibes the basics of intelligence quotient (IQ), emotional quotient (EQ), X quotient (XQ) and spiritual dimension has been proposed to measure readiness for individual-level health behavior change. PQ can be defined as a sum total of combined cognitive capacity, balanced emotions, desirable personality traits, and spiritual awareness to meet the best possible success of life goals. The present article reifies this concept into a practical scale that includes the concept of IQ implicitly by developing the scale at less than seventh-grade level. It explicitly operationalizes the concept of EQ through three constructs namely self-awareness, mood management, and self-motivation into a health emotional quotient (HEQ). It also operationalizes the concept of health X quotient (HXQ) through the constructs of cautiousness, independence, and competition with self. Finally, it operationalizes the concept of health spiritual quotient (HSQ) through the constructs of self-love and love for others around oneself. The summation of HEQ, HXQ, and HSQ yields the PQ score which can range from 0-100 units. It is proposed that score of 0-25 units indicates needing improvement low perfection score; a score of 26-50 units indicates needing improvement small perfection score; a score of 51-75 units indicates moderate perfection score that can be better; a score of 76-100 units indicates high perfection score on the continuum and high readiness for health behavior change. The scale can be freely used by health behavior researchers while providing due credit. Recently a novel concept of perfection quotient (PQ) that integrates the concepts of intelligence quotient (IQ), emotional quotient (EQ), X quotient (XQ) and spiritual dimension of love toward self and for others has been proposed [1, 2]. PQ can be defined as a sum total of combined cognitive capacity, balanced emotions, desirable personality traits, and spiritual awareness to meet the best possible success of life goals. The concept can be applied in several spheres of human activity including but not limited to health behavior research. The term ‘perfection quotient’ (PQ) has received an overall positive response from health professionals and researchers with some disagreement related to the semantics. Different terms have been suggested as alternatives, for example “Utopian Quotient (UQ)” (e-mail to first author from Brian Flay, Oregon State University, April 14, 2018; unreferenced), “Wholeness Quotient (WQ)” (e-mail to first author from Bill Cissell, Jackson State University, April 13, 2018; unreferenced), “Healthy Striving Quotient (HSQ)” or “Readiness Quotient (RQ)” (e-mail to first author from Nicole Aydt Klein, Southern Illinois University Edwardsville, April 16, 2018; unreferenced), “Excellence Quotient (EQ)” (suggestion from co-author, Amar Kanekar). However, in our collective opinion, all these terms connote the same meaning to the concept which is inspired by the World Health Organization’s (WHO) definition of health as, “a state of complete physical, mental, and social well-being and not merely the absence of disease or infirmity” . The WHO definition indicates a utopian state, depicts wholeness, aims for excellence and fosters movement through readiness and perfection seems to be the best characterization for this concept. PQ is a quotient which assesses readiness to individual level health behavior change on a continuum with the ultimate static state of perfection as the goal. This concept has been suggested to predict readiness for individual level health behavior change for a variety of target populations. Interest in determining readiness for behavior change emanated from the rationale that it might not be a good idea to develop behavior change interventions for people who are not prepared to undertake such change. Deriving from the work of Miller  on motivational interviewing in the area of alcohol education and Prochaska’s work on transtheoretical model , Rollnick and colleagues first developed a Readiness to Change Questionnaire (RCQ) . The questionnaire was designed to ascertain the readiness of excessive drinkers to behavior change based on the transtheoretical model or stages of change model. Recent evidence-based work utilizing multiple theory models particularly the multi-theory model (MTM) of health behavior change dissects behavior change into initiation and sustenance components [7, 8]. Work with MTM finds that a substantial number of participants are not ready to change their behavior and are reluctant to sustain behavior change let alone initiate it [9-16]. 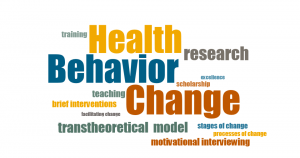 Thus, determining readiness to behavior change for health behaviors and its applicability to different target populations assume great importance for health education specialists designing interventions for such positive behavior changes. The purpose of this article is to develop a questionnaire to assess readiness for behavior change based on the novel concept of perfection quotient (PQ). At present there is no instrument that measures this concept. The concept of PQ builds first from the concept of intelligence quotient (IQ). It is well established that basic intelligence is needed for comprehending and effecting change in behavior. The proposed scale uses grade level as a proxy measure for calculating intelligence. The scale is at Flesch-Kincaid grade level of 6.4 or less than seventh or eighth grade level which is typical for health education materials . The second aspect in PQ is that of emotional quotient (EQ). This is identified as the first domain in the questionnaire and utilizes three constructs from the theory of emotional intelligence [8, 18, 19]. Typically, the concept of emotional intelligence has five constructs namely self-awareness (identifying one’s emotions as they occur); mood management (appropriate dealing with feelings as they arise so that they do not cause harm to self or others); self-motivation (ability to direct feelings toward goals); empathy (recognizing the feelings in others by observing their verbal and nonverbal forms of communication); and managing relationships (appropriate handling of interpersonal dealings and resolving conflicts). In terms of individual level behavior change context only the first three are relevant and the other two are more for relationship handling (interpersonal behavior). For the purpose of developing the questionnaire the first construct in the instrument is that of self-awareness which has been operationalized as the measurement of the frequency and ability of knowing positive and negative feelings before they arise and ability to distinguish between feelings through three items measured on a rating scale of never (0), hardly ever (1), sometimes (2), fairly often (3), very often (4) yielding a possible range of 0-12 units. It is proposed that higher the score for self-awareness the greater will be the readiness for health behavior change. The second construct in the instrument is that of mood management which measures the frequency and ability of managing and reacting appropriately to positive and negative feelings through four items measured on a rating scale of never (0), hardly ever (1), sometimes (2), fairly often (3), very often (4) yielding a possible range of 0-16 units. It is proposed that higher the score for mood management the greater will be the readiness for health behavior change. The third construct in the instrument is self-motivation which has been operationalized as measurement of the frequency and ability of directing feelings toward a goal while overcoming self-doubt and inaction through three items measured on a rating scale of never (0), hardly ever (1), sometimes (2), fairly often (3), very often (4) yielding a possible range of 0-12 units. It is proposed that higher the score for self-motivation the greater will be the readiness for health behavior change. Together these three constructs determine the score of health emotional quotient (HEQ) a summation of ten items with a score of 0-40 units which is the first explicit domain of PQ. High HEQ scores will predict greater readiness for health behavior change. The second explicit domain in PQ is that of X Quotient or XQ . XQ is based on the recent trends in organizational behavior to assess potential employees in several personality traits that are deemed to predict success in potential job performance in particular situations. This work builds on Gordon Allport’s work on trait theory which emphasized determination of behavior through broad enduring dispositions . The specific constructs for XQ vary for different job requirements. For the purpose of determining health X quotient (HXQ) three constructs are considered to be important. The first construct is cautiousness construct that measures the frequency and ability to plan things, not being driven by impulsivity and being a planner as opposed to being unpredictable measured through three items and measured on a rating scale of never (0), hardly ever (1), sometimes (2), fairly often (3), very often (4) yielding a possible range of 0-12 units. It is the opposite of spontaneity which can be considered detrimental to readiness for health behavior change. Cautiousness as proposed would be beneficial for readiness for health behavior change. The second construct in the domain of HXQ is the independence construct that measures the frequency and ability to function alone, not relying on others in making life decisions and drawing attention to self that is measured through three items on a rating scale of never (0), hardly ever (1), sometimes (2), fairly often (3), very often (4) yielding a possible range of 0-12 units. Once again higher the independence score the greater will be the readiness for health behavior change. The third construct is competition with self that measures the frequency and ability to compete with oneself to achieve optimal health, liking for achieving optimal health and challenging oneself toward becoming better measured through three items on a rating scale of never (0), hardly ever (1), sometimes (2), fairly often (3), very often (4) yielding a possible range of 0-12 units. It is proposed that higher the score on competition with self the propensity for readiness for health behavior change will be higher. Together these three constructs determine the score of Health X Quotient (HXQ) which is a summation of nine items with a score of 0-36 units. Higher the HXQ greater will be the likelihood of readiness for health behavior change. The third and final explicit domain in the calculation of PQ is the health spiritual quotient (HSQ). This includes two constructs: self-love and love for others around oneself. The importance of love has been underscored by several researchers [22, 23, 24, 25, 26]. The construct of self-love is operationalized as the frequency and ability to love oneself to care about one’s body, mind and spirit as measured through three items on a rating scale of never (0), hardly ever (1), sometimes (2), fairly often (3), very often (4) yielding a possible range of 0-12 units. It is proposed that higher the score on self-love the greater a person will be ready for making health behavior changes. The construct of love for others around oneself is operationalized as the frequency and ability to take better care of one’s body, mind and spirit so that one can take better care of others. This is measured through three items on a rating scale of never (0), hardly ever (1), sometimes (2), fairly often (3), very often (4) yielding a possible range of 0-12 units. Together these two constructs determine the score of HSQ which is a summation of six items and yields a score of 0-24 units. Higher the HSQ greater will be the likelihood of readiness for health behavior change. Finally, the summation of HEQ, HXQ and HSQ yields the PQ score which can range from 0-100 units. It is proposed that score of 0-25 units indicates needing improvement low perfection score; score of 26-50 units indicates needing improvement small perfection score; score of 51-75 units indicates moderate perfection score that can be better; score of 76-100 units indicates high perfection score on the continuum and high readiness for health behavior change. The complete scale is provided in Appendix I. This scale can be replicated freely and by acknowledging the citation and the originator, not-for-profit organization, Health for All, Inc. The scale is face and content valid. Further studies can establish the internal consistency reliability of the subscales using Cronbach’s alpha and construct validation using confirmatory factor analysis. Also, useful will be to establish test-retest reliability. We will be using this scale for future research related to assessing readiness for individual level health behavior change and it is envisaged that this scale will be tested for psychometric properties and predictive modelling in health behavior research by other researchers to ameliorate the efficacy and effectiveness of health education and health promotion interventions. While intelligence which is largely genetically linked and is implicit in PQ cannot be modified but the HEQ, HXQ and HSQ that are explicit in PQ are modifiable constructs. Interventions can be designed for those individuals who score low or small on PQ score to improve aspects of HEQ, HXQ and HSQ. Individuals who score moderate or high on PQ can be considered ready for behavior change and can be administered evidence-based (theory-based) health behavior change health education or health promotion interventions. Sharma M. Proposing the concept of Perfection Quotient (PQ) as a measure of readiness for health behavior change. Journal of Medical Research and Innovation. 2018; 2 (2) : e000116 . Sharma M. Is there a role of Perfection Quotient (PQ) in alcohol and drug education. Journal of Alcohol and Drug Education Journal. 2018; 62 (1) : 3-7 . WH O. Constitution of the World Health Organization. Chron World Health Organ. 1974; 1 : 29-43 . Miller WR. Motivational interviewing with problem drinkers. Behavioural and Cognitive Psychotherapy. 1983; 11 : 147-172 . Prochaska JO. Systems of Psychotherapy: A Transtheoretical AnalysisDorsey Press: 1st ed. Homewood; 1976. Rollnick S, Heather N, Gold R, Hall W. Development of a short readiness to change questionnaire for use in brief opportunistic interventions among excessive drinkers. British Journal of Addiction. 1992; 87 : 743-754 . Sharma M. Multi-theory model (MTM) for health behavior change. Webmed Central Behaviour. 2015; 6 (9) : WMC004982 . Sharma M. Theoretical Foundations of Health Education and Health PromotionJones & Bartlett Learning: 1st ed. Sudbury; 2017. Brown L, Sharma M. Using multi theory model of health behavior change to predict fruits and vegetables consumption among African American women. Proceedings of the American Public Health Association Annual Meeting. 2017; 145 : 3248 . Dokun-Mowete CA. Using Multi-theory Model to Predict Low Salt Intake - Nigerian Adults with Hypertension. 2017. Hayes T, Bridges L, Sharma M. Developing and validating an instrument to measure change in binge drinking to responsible drinking in college students using multi-theory model (MTM) of health behavior change. American Public Health Association Annual Meeting. 2017; 145 : 4173 . Hayes T, Nahar VK, Sharma M. Predicting physical activity behavior in African American females: Using multi theory model. Journal of Research in Health Sciences. 2018; 18 (2) : e00410 . Knowlden AP, Sharma M, Nahar VK. Using multitheory model of health behavior change to predict adequate sleep behavior. Family & Community Health. 2017; 40 (1) : 56-61 . Nahar VK, Sharma M, Catalano HP, Ickes M, Johnson P, Ford MA. Testing multi-theory model (MTM) in predicting initiation and sustenance of physical activity behavior among college students. Health Promotion Perspectives. 2016; 6 (2) : 58-65 . Sharma M, Catalano HP, Nahar VK, Lingam V, Johnson P, Ford MA. Using multi-theory model to predict initiation and sustenance of small portion size consumption among college students. Health Promotion Perspectives. 2016; 6 (3) : 137-44 . Sharma M, Catalano HP, Nahar VK, Lingam V, Johnson P, Ford MA. Applying multi-theory model (MTM) of health behavior change to predict water consumption instead of sugar sweetened beverages. Journal of Research in Health Sciences. 2017; 17 (1) : e00370 . Sharma M, Petosa RL. Measurement and Evaluation for Health EducatorsJones & Bartlett Learning: 1st ed. Burlington; 2014. Goleman D. Emotional intelligenceBantam: 1st ed. New York; 1995. Salovey P, Mayer J. Emotional intelligence. Imagination, Cognition and Personality. 1990; 9 : 185-211 . Gray E. The XQ factor. Time. 2015; 185 (23) : 40-6 . Allport GW. Personality: a psychological interpretationHolt: 1st ed. New York; 1937. Eriksson K. Caring science in a new key. Nursing Science Quarterly. 2002; 15 (1) : 61-5 . Foss B, Eriksson K, Naden D. Love and responsibility: A new understanding of leadership. Nursing Science Quarterly. 2018; 31 (2) : 148-56 . Maunder B, Hunter J. Love, Fear, and Health: How Our Attachments to Others Shape Health and Health CareUniversity of Toronto Press: 1st ed. Toronto; 2015. Siegel BS. Love, Medicine and Miracles: Lessons Learned About Self-healing from a Surgeon's Experience with Exceptional PatientsHarper Collins Publishers: 1st ed. New York; 1986. Transue E. Patient by Patient: Lessons in Love, Loss, Hope, and Healing from a Doctor's PracticeSt. Martin’s Press: 1st ed. New York; 2008. Manoj Sharma, Amar Kanekar, Ram Lakhan, 2018.